The staff of the Fayetteville City Government Channel, led by manager Fritz Gisler, produce short videos about the history of Fayetteville, called Faytteville History Minute, which air on the government channel. 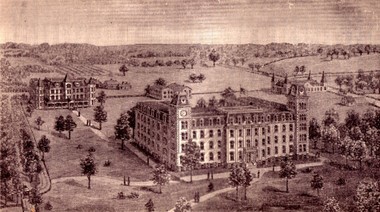 An 1890 engraving of the University of Arkansas campus shows University Hall, now known as Old Main, at the center of campus. Other buildings include Buchanan Hall to the left, the original frame classrooms used while Old Main was being built, and the Agricultural Experiment Station beyond the north tower. The symbol of higher education in Arkansas, Old Main was the first permanent building to be erected on the Arkansas Industrial University campus. Its exterior was finished in 1875, just three years after the university opened for classes. It is the oldest building still standing on the campus and the only one built in the 19th century still standing. Moving the taller tower to the north would symbolize the Union’s victory in the Civil War, waged less than a decade earlier. The university was founded and organized during Reconstruction, so Unionists still held sway politically and may have been happy to take credit for the change. The contractor got drunk and looked at the plans backwards. This seems less plausible given the Baptist background of the contractor. Both of these stories appear to be legends. Don Schaeffer in his history of Old Main says the switch was made to make it easier for residents of downtown Fayetteville to see the clock tower, not that there was a clock to see. Because of expense, installation of a clockworks was put off. During the early part of the 20th century, professors erected a large aerial between the towers of Old Main, barely visible in this picture, to receive radio signals. In 2005, a clock was finally installed as part of the culmination of the Campaign for the Twenty-First Century, ending a timeless tradition. Today, Old Main is home to the dean’s offices of the J. William Fulbright College of Arts and Sciences as well as several academic departments. Giffels Auditorium, refurbished to its original look, is on the second floor. Schaefer, Don. “History of University of Arkansas Buildings (Unpublished manuscript, most recently updated April 29, 2003). Facilities Management. Historic Buildings (University of Arkansas Facilities Management: 2003). Rothrock, Thomas. “The University of Arkansas’s ‘Old Main,’” Arkansas Historical Quarterly (Arkansas Historical Association, Fayetteville) Spring 1971. Interesting to see the rumors about the Old Man building versus facts (the clock was placed facing North so citizens could view the time). It's amazing how rich the history of the university building truly is.